Sr. Lorraine Arsenault, PM (Sr. M. Ste. 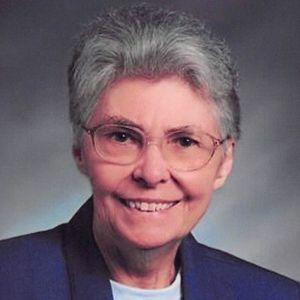 Louise-de-France), 87, of the Sisters of the Presentation of Mary, died April 13, 2019. She was born in Berlin on November 13, 1931 to John and Marie-Louise (Cote) Arsenault. She served in the Congregation of the Sisters of the Presentation of Mary for 65 years. Sr. Arsenault earned a bachelor's degree from Rivier College and master's degrees from Boston College and the University of Connecticut. She taught in elementary schools throughout New Hampshire and worked at Rivier College/University as an instructor and assistant and associate professor. She was also a clinical social worker at Catholic Charities in Nashua. In 2010 a new Harbor Home in Nashua was named "Safe Haven – Lorraine Marie House" in her honor. She retired to St. Joseph Residence II in Manchester in June of 2018. She was predeceased by her parents and four siblings, Henry Arsenault, Lena Hansen, Rose Skaradoski and Jeanne Paulin. The family includes nieces, nephews and cousins. SERVICES: Calling hours are Monday (4/22) from 2 to 5 p.m with a prayer service at 4 p.m. in the Resurrection Chapel of St. Marie Residence, 495 Mammoth Rd., Manchester. A Mass of Christian Burial will be celebrated Tuesday (4/23) at 10:30 a.m. in the Resurrection Chapel. Private burial will be in Presentation of Mary Cemetery in Hudson. Lambert Funeral Home & Crematory, Manchester is assisting the family with arrangements. Add your thoughts, prayers or a condolence to Sr. Lorraine's guestbook.